Budapest is the capital city of Hungary, made up of Buda and Pest, with the Danube River flowing past them, along a stretch of 28 kilometers. The two previously independent cities together with Óbuda were united in 1873, and became a single city occupying both banks of the River Danube. The famous public buildings, the green hills of Buda, the wide avenues and shopping centers of Pest, the connecting bridges over the river really make Budapest one of the most enjoyable cities in Europe. Budapest is often called the "Queen of the Danube". The mighty River Danube flows 2850 kilometers long through Europe from the Black Forest in Germany to the Black Sea and passes through Germany, Austria, Slovakia, Hungary, along the Croatian-Serbian border, and then forms the border between Bulgaria and Romania on its journey to the swampy delta at Sulina. It is Europe's second longest river after the Volga. In Vienna, the capital of Austria, the Danube does not run through the center of the city. In Budapest, however, it cuts right through the heart of the city, providing a magnificent view. Read further about the main attractions on both Danube banks, or click on the right to read about the bridges of Budapest. Margaret Island (Margit-sziget) lies between the Arpad Bridge and Margaret Bridge, it is located in the middle of the river Danube. It used to be a monastery island until the Turkish occupation. 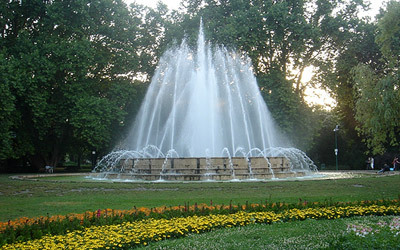 In the 19th century a park and an entertainment center was opened to the general public. In the course of the day the island is occupied by people doing sports, or just having a rest. Margaret Island with its large green areas, flowery gardens, and old trees provides a peaceful hideaway from the hectic downtown of Budapest. The island's attractions include romantic walkways, medieval ruins, a small zoo, a music fountain, a water tower, swimming pools and relaxing atmosphere. You can rent a "family bike" known as Bringohinto there. Devote half a day or at least a couple of hours to explore and enjoy the serenity on Margaret Island. The commanding building of Hungarian Parliament stretches between Margaret Bridge and Chain Bridge on the Pest bank of the Danube. It draws your attention from almost every riverside point. The Gellért Hill and the Castle Hill on the opposite bank offer the best panorama of this huge edifice. 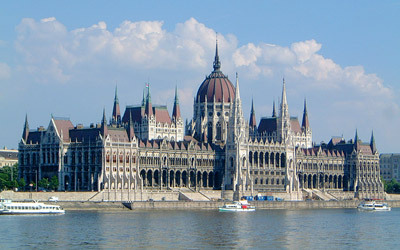 The building of the Parliament is 268 m long and 123 m wide, it has 691 rooms. This is the third largest parliament building in the world. The length of all the stairs together measures about 20 kilometers. The most impressive is the grand staircase. The central dome's height reaches 96 m. The building has 27 entrance gates. If you go to the embankment on Kossuth Square, just past the statue of the poet Attila József, next to the Hungarian Parliament building, you can see the place where the emergency pontoon bridge (Kossuth Bridge) set off towards Batthyány Square on the other side. The inscription reads: "At this place stood Kossuth Bridge. Our workers' heroic and self-sacrificing work built the bridge as a temporary replacement in eight months for all the bridges senselessly blown up by the Fascists." On 18 January 1946, on the first anniversary of the last Fascist bombing, it was opened to traffic. Its temporary objective at an end, it was taken down in 1960. Stroll between Roosevelt Square and Elizabeth Bridge along the Danube in Pest and take in the superb view of the opposite Castle Hill and the river. Rows of cafes and luxury hotels line the riverbank. Although Danube Promenade had its heyday in the second half of the 19th century, it is still tempting for a walk. Rising 48 meters above the Danube, the Castle Hill (Várhegy) dominates the city. This hill is the place where Budapest was founded. 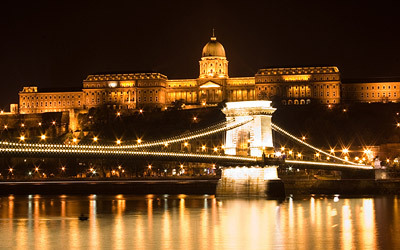 It is a small, densely built rock, with the Buda Castle as the most prominent building. The name Buda Castle covers more than a castle or the Royal Palace in the capital city; it extends to the historical quarter full of sites. Trinity Square, Matthias Church, Fishermen's Bastion, Mary Magdalene Tower, Castle District, Royal Palace, Cave system. The Castle area consists of two distinct parts: the Old Town (Vár) and the Royal Palace (Budavári Palota). On bright spring days people invite friends for a "walk in the Castle", i.e. to wander around the Castle Hill quarter. The most exiting way of getting to the Castle is by taking the Funicular, a little cable car up the Castle Hill. The Gellért Hill received its name after St. Gellert who came to Hungary as a missionary bishop upon the invitation of King St. Stephen I. around 1000 A.D. Looking northward from the hilltop the Buda hills and the Pilis mountains can be seen. On the Buda side, we can almost look into the streets of Castle Hill and recognize the southern fortifications of the Royal Palace. Directly below us we see the slopes of the former Tabán district converted into a park. The Tabán was once a Turkish suburb of small houses. All the Danube bridges are visible; the nearest are Elizabeth Bridge and Liberty Bridge; towards the south we see Petofi Bridge and the Southern Connecting Railway Bridge with the Lagymanyosi Bridge beside, towards the north the Chain Bridge, Margaret Bridge, Arpad Bridge and the Northern Connecting Railway Bridge. Slightly to the right of the Nothern Connecting Railway Bridge you catch sight of the highest point of the two 100 meter high pillars of the Megyeri Bridge. On the Pest side the dome of the Parliament building dominates the view. 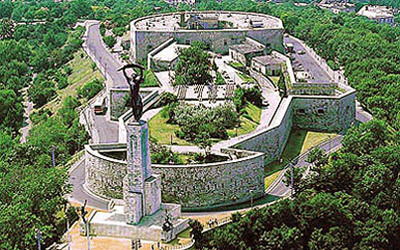 The Citadel, the fortress on top of the hill, was built by the Habsburgs between 1850 and 1854 to demonstrate their control over the Hungarians after the suppression of the Hungarian War of Independence. The walls in the east-west direction are 200 meters long, 4 to 6 meters high and at some points 3 meters thick. By a short walk one can reach the Liberation Monument. The statue was erected in 1947 after World War II. The main figure is a woman, holding an olive branch, the symbol of peace in her hands. On both sides symbolic figures can be seen: the young man's victory over the dragon represents the defeat of fascism.